Extraordinist Craig Karges is known to millions of television viewers for his remarkable demonstrations of extraordinary phenomena on The Tonight Show with Jay Leno, Larry King Live, and many other TV shows. He presents his critically acclaimed one-man touring show "Experience the Extraordinary" each year at performing arts centers, universities and corporate events in over 150 cities worldwide. 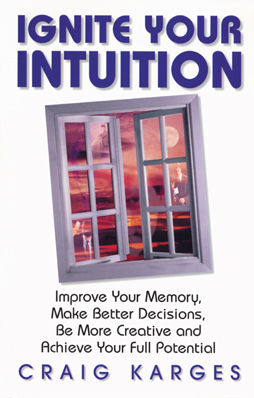 Now, Karges shifts his focus from entertainment to empowerment with Ignite Your Intuition. Dispelling the myths of psychic powers, Karges reveals how to unlock the extraordinary natural powers of your mind. This book will awaken you to the possibility of truly realizing your full potential. You will learn techniques to test your intuition, as well as how to tap into your unconscious mind to improve your memory, intuition, and creativity. You will also learn how to use your intuition to solve problems, make better decisions, develop innovative ideas, forecast your future — even how and when to be in the right place at the right time. Karges reveals to you proven techniques to program the subconscious mind for success. If you ever wished that you knew all the secrets and wonders reserved for “gifted” individuals, this book is for you. You will discover that these “gifts” lie hidden within your own mind. Craig Karges will teach you how to unlock these extraordinary powers, achieve your goals and become the person you have always dreamed of being. Price: $12.95, plus shipping and handling.